DADCO’s is committed to continuous improvement. Year over year, we have worked to develop highly effective products while improving existing products to meet customer demand. Below are the legacy products that are either available in limited quantity or have been discontinued following the release of new or improved designs. The Power Lift Actuator is an automated power transmission device that converts rotary motion to linear motion when connected to a power source, such as a cylinder or motor. Designed for limited space applications, the Power Lift Actuator can raise, lower, rotate, clamp, push, pull, check, position, or actuate any unit load or fixture simply and economically. The Power Lift Actuator series is extensive, offering units with 1:1 or 2:1 capability, diverse and universal mounting options, and various hub choices. To facilitate installation layouts, CAD templates are available for the Power Lift Actuator series. 90.9 Series – Compact High Tonnage Nitrogen Gas Springs – Discontinued! This series has 4 models ranging from 15 kN – 75 kN and is 63 mm -77 mm (2.5″-3″) shorter than ISO Standard Nitrogen Gas Springs. For replacement springs please contact your sales representative. Core Pin Cylinders – Discontinued! 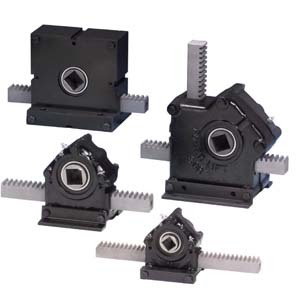 Ideal for plastic injection molds, the DK Series is available in two bore sizes (40 mm & 50 mm) and built with long-lasting high-temperature seals to withstand temperatures inside plastic molds; up to 204°C (+400°F) for constant duty and up to 260°C (+500°F) for short durations. 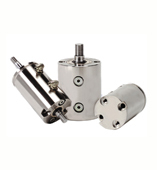 Optionally, these cylinders are available in a double rod end model and a non-rotating model for use in a variety of applications.